Mahjong Towers Eternity Game Review - Download and Play Free Version! A Mahjong Game So Complete and Full of Relaxing Fun You May Never Have to Worry About Getting Another Mahjong Game Again! Enriching tile matching game that is brain stimulating. You can create your own tile layouts. Download layouts from the internet daily. Over 250,000 layouts and growing. There is only one difficulty. Pairing the tiles is monotonous after awhile. Over 2000 layouts and growing daily! 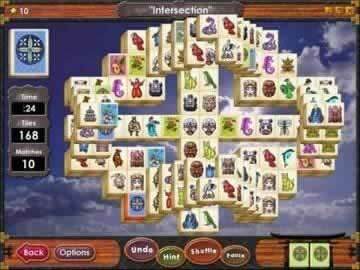 Mahjong Towers Eternity lets you play all your favorite mahjong game styles and then some. Feel the accomplishment of finishing layouts and earning better and better reward badges. Automatically get new layouts every day so you can play the most creative boards the mahjong community has to offer. Contribute your own layouts by designing them in the game and saving them for others. Mahjong Towers Eternity also lets you chat with other players - right in the game! This is a fun way to meet new people, talk about your favorite layouts, and even discuss user designed layouts with those who made them. Do you like to decorate or add perhaps a bit of a personalized touch to your game? How about this - upload your favorite family picture, pet, or beautiful scenery right into the game to use as a background while solving mahjong layouts - very nice! With beautiful music, colorful backgrounds, new levels all the time - Mahjong Towers Eternity may be the last mahjong game you will ever search for! If mahjong is your forte or if you are just now getting into the game, Mahjong Towers Eternity is the perfect game for you. 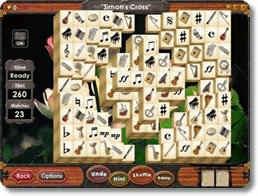 This game is as complete a single player mahjong game as you will find. There are over 250,000 layouts (yes, that's 250,000) for you to play and enjoy. 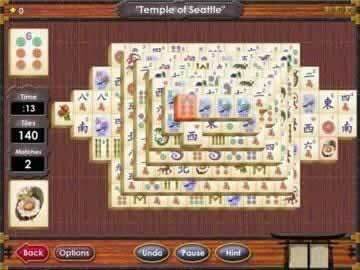 With all the different layouts it would take you a lifetime to get through this game. Mahjong, for those of you not familiar with the name, is a Chinese tile matching game. Through pairing up like tiles you eliminate them from the game space. The goal is to eliminate all of the original tiles as quickly as you can. There are strategic elements of the game that help you pair up every piece. It is good to get rid of as many tiles as you can early and then slow down and strategically eliminate pieces that will help you in the long run. Mahjong Tower Eternity offers hints and a shuffle option that can be used to help you solve the layouts. This help comes at a cost however, as hints give you a 10 second penalty and a shuffle costs you a minute worth of time. Finishing the complete map can be tricky (even with the helpful hints), but is rewarding and possible, even though it often seems impossible. One aspect of mahjong that is important are the different layouts and designs the tiles can make. You might play a layout in the shape of a butterfly or maybe a pyramid. Layouts are typically different and add an interesting difficulty and aspect to the game. Mahjong Towers Eternity is one of the best single-player mahjong tile games on the market for several reasons but mainly because of its different layouts. In Mahjong Towers Eternity you can choose from over 250,000 different layouts that vary in both design and difficulty. A fraction of the layouts are stock for the game, because most are downloadable designs created by others throughout the world. New layouts are created and added daily adding to the total number. As an owner of the game you are also granted the power of creating your own layouts that you can play by yourself or share with others throughout the world. Having so many layouts that can be shared makes it so you will never run out of new playing options. This game is super re-playable because you will never have to play the same thing twice. There are a few flaws of the game that detract from its overall quality. The main hitch is not having a multiplayer setting or having the ability to play with others. Interacting with other players through playing and not just sharing new layouts would be a nice feature of the game. Not having multiplayer doesn't take too much away from the game, however, having the feature would be really great. Mahjong Towers Eternity is a great mahjong tile game. In this you will be able to create your own layouts, or share layouts via the internet. This ability to share opens the game up, allowing you to play on any of over 250,000 different layouts. Though you will not be able to play against others via multiplayer the game allows you to associate and chat with other players. This mahjong game is superior when it comes to tile matching games, and can be played by all ages. The strategic element might make it hard for younger players to solve puzzles, however, playing should not be a problem. Mahjong Towers Eternity does a lot of things right and is a great download that you should checkout if you are looking for mahjong tile game.